Tuesday June 3, 2014 I attended the Future of Navigation Listening Session in Seattle. This was a chance for Puget Sound boaters to find out about recent Aids to Navigation changes and hear about changes on the way and for boaters to give feedback on their needs and concerns on the future of navigation. I arrived way early for the session, that was a very good decision as LT R David Lewald, USCG introduced himself and we had a nice chat before the meeting started. I expressed concerns I and my friends had as recreational boaters. The concerns ranged from shifting to AIS (Automatic Identification System) based Virtual Aids to Navigation (ATON’s that are not physical but represented by an AIS signal (see below for more info)) to the changing of the physical ATON’s and a concern the physical ATON’s would be removed. Mr Lewald indicated that the Coast Guard District 13 would be maintaining the current ATON’s, however he noted that change happens and vessel traffic changes over time and the ATON’s need to change to meet the changing needs. He also said that the Coast Guard was adding new tools to help them better meet recreational boaters needs and the open Listening Sessions held at several cities are another attempt to get feedback from everyone that uses the waterways. 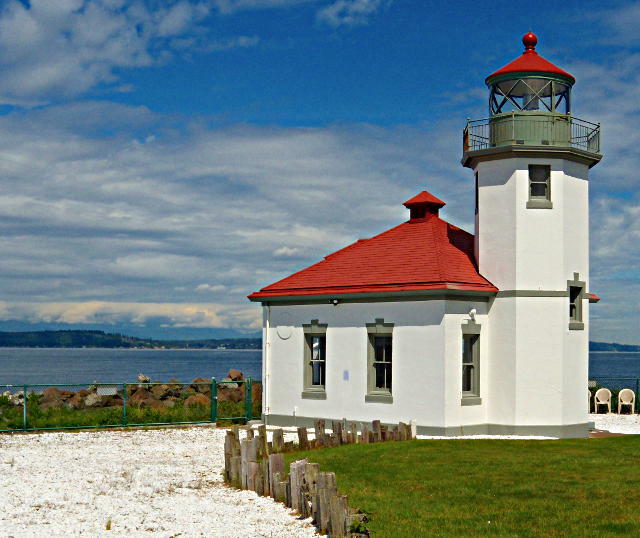 Lighthouses are a special item that stir up a lot of passion in many people (The Alki Lighthouse in West Seattle has people come from all around the world to see it). From a technical standpoint, most lighthouses could be torn down and replaced with an automated light on a tower. Tearing down lighthouses is not very popular, so the Coast Guard has sold many lighthouses to private non-profit groups or local government groups. The groups maintain the lighthouse and in many cases give tours and the Coast Guard maintains the light. This preserves history as well as keeps a needed ATON in operation. 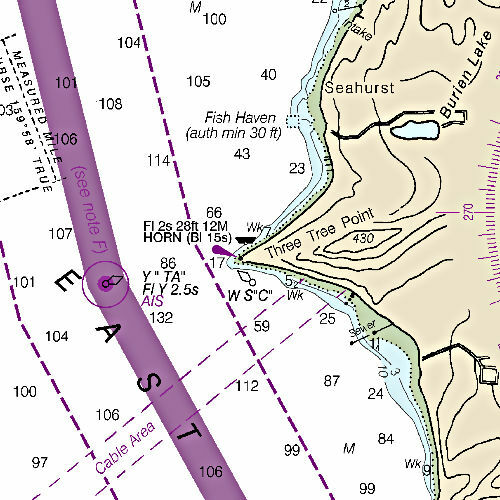 92,000 aids to navigation (about 720 of these are in the Puget Sound area, from the entrance to the Strait of Juan De Fuca, through the San Juan Islands to Bellingham and south to Olympia. The Coast Guard maintains about 550 of these, 170 are Private Aids to Navigation (PATON) that are not maintained by the Coast Guard. The U.S. Maritime Transport System and the Waterways are a shared responsibility at the national level with the U.S. Coast Guard, U.S. Army Corps of Engineers and NOAA, they share bulk of the responsibility and are the most visible, other US government agencies also help. These groups work with state and local agencies to make our waters safe for all users of the waterways. One of the major challenges to waterway safety is the ships are now larger with deeper drafts, wider beams and higher Air Draft (height above water), while channel dimensions have remained relatively constant. The conflict of larger ships in channels that have not gotten larger, ships need more accurate navigation charts, the dredging of the channels is very critical and ATON placement is more critical. NOAA has new technology for charting the waterways that shows the bottom profile and shoaling very precisely (NOAA has also found several shipwrecks using the improved technology), this improved precision allows the Coast Guard to place ATON’s more accurately for safe passage and to have more accurate notices in the Local Notice to Mariners to allow ships to avoid hazardous areas. With more accurate charting, the Army Corps of Engineers can do spot dredging in channels and not always dredge the entire channel, that saves money, has less of an environmental impact and traffic in the waterway is less disrupted by dredges. Traditional Aids to Navigation (ATON) are starting to be augmented with AIS (Automatic Identification System) ability. 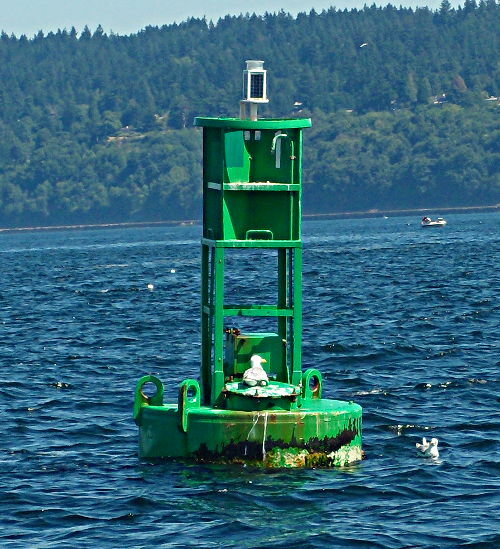 Testing of AIS ATON’s are happening in many places including Puget Sound. There are three different versions of AIS ATON’s, each have advantages and disadvantages, like all tools, it is the proper choice of the tool for the job that is important. Real AIS ATON – An AIS station is placed on an existing physical aid to navigation, the actual position of the ATON is broadcast. Synthetic AIS ATON – An AIS Base Station broadcasts a position signal that coincides with an existing physical ATON’s location. Virtual AIS ATON – An electronically charted ATON that does not coincide with a physical ATON. A Real AIS ATON, because it is on a physical ATON the technology exists for the ATON to phone home so to speak and tell the Coast Guard when it is off station. The Coast Guard could then put a notice on the AIS display that the ATON is off station. Yes a vessel needs AIS to see the display, but since the notice could be real time, the Coast Guard could also put out a Marine Advisory on the VHF for the general public. A Synthetic AIS ATON, is when it’s indicated position is the same as a physical ATON but it is not attached to the ATON, while a physical ATON can go off station, the AIS signal will not go off station and should always show the proper position for use by vessels equipped with AIS. The “SF” Buoy at the entrance to San Francisco Harbor has Synthetic AIS added to it, the buoy is large, expensive and the average service life in the past has been about 30 months between getting struck by a ship. The hope is that the AIS ATON will help ships avoid hitting the SF Buoy, saving the Coast Guard time and money by not needing to replace the buoy and vessel traffic will be safer with the SF Buoy on station more. A Virtual AIS ATON, is not related to a physical ATON and could be added or deleted as required. Since is not a physical ATON a vessel can run over a Virtual AIS ATON with no damage to either the vessel or the ATON. 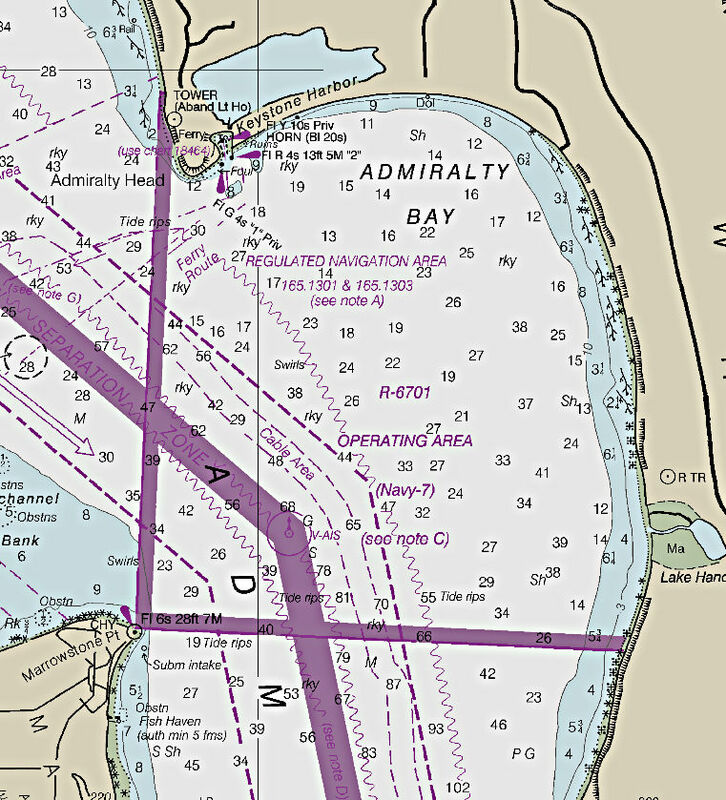 The Entrance to San Francisco has Virtual AIS ATON’s added to the approach lanes to remind vessels that they need to check in. The VTS lanes off Marrowstone Point now have a Virtual AIS ATON to show a turning point in the VTS lanes. Virtual AIS ATON’s have also been used in San Francisco Harbor to show sailing regattas and other temporary activities on the water that need extra caution by boats. A Virtual AIS ATON can be added for only the days required. An advantage any AIS ATON has, relates to the AIS systems on vessels that have collision avoidance and Closest Point of Approach (CPA) abilities, so if a vessel is on a collision course with an ATON or passing too close alarms will go off on the vessel alerting the person at the helm that they have a problem. Different types of AIS ATON’s are being tried on bridge towers and abutments to help make the bridges more distinctive, this is both in place of and in addition to RACON’s (Radar Transponder (combination of RAdar and beaCON)). Another change to ATON’s has been the switch to LED lights over the last several years. As LED’s have became more powerful they have been able to replace conventional lights on ATON’s with no loss in range of visibility. Early LED ATON’s sometimes had a reduction in visibility compared to conventional lights. LED bulbs last longer than other lights and are more efficient. By combining the LED bulbs with rechargeable batteries and solar panels several advances happen. Solar panels mean that long power cords no longer need to be ran to an ATON. Many ATON’s are on breakwaters and other structures that need underwater cables ran, the cables are no longer required, saving money with installation and maintenance. Many buoys with lights used non-rechargeable batteries in the past. That required the batteries to be changed on a regular basis, batteries needed to be purchased and the buoys visited to change the batteries. Many times the light was forgotten until someone called in an ATON discrepancy report and the Coast Guard called the owner of the light and ask them to change the batteries. By putting LED ATON’s with solar cells and rechargeable batteries the replacement time can in many cases be changed from a few months to several years. The rechargeable batteries on many of the LED ATON’s can now be changed in the field to extend the service life of the light. Money is saved and the waterway is safer by having lights that are more reliable. 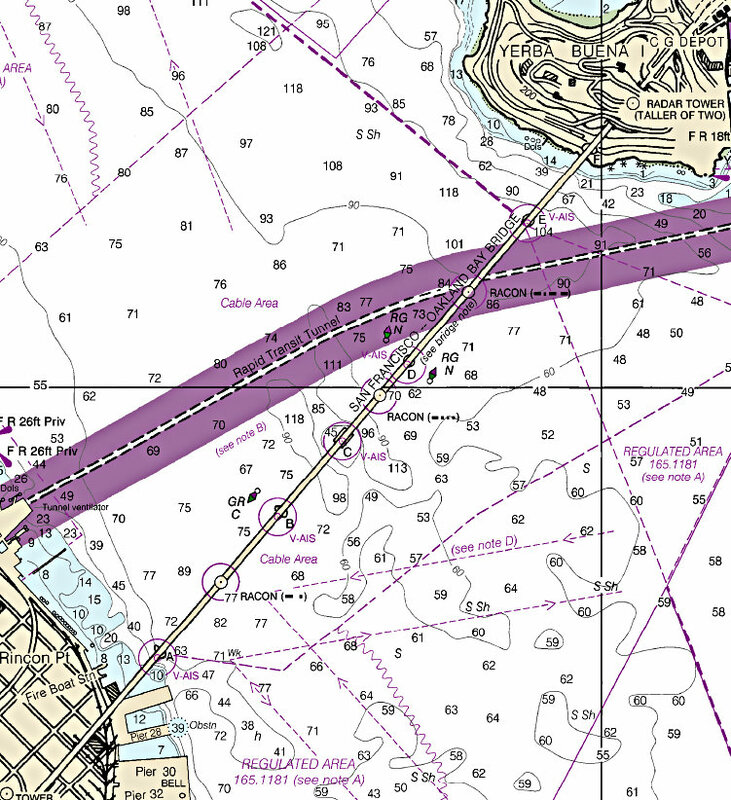 The Coast Guard has a Nationwide Automatic Identification System (NAIS), the system records ship movements of ships equipped with AIS, this information is being used for improving Waterway design. In one case a waterway was on the chopping block as not being relevant any more, with the NAIS information, the Coast Guard was able to produce some “heat maps” that showed the waterway was still a major waterway based on vessel traffic, no guessing. 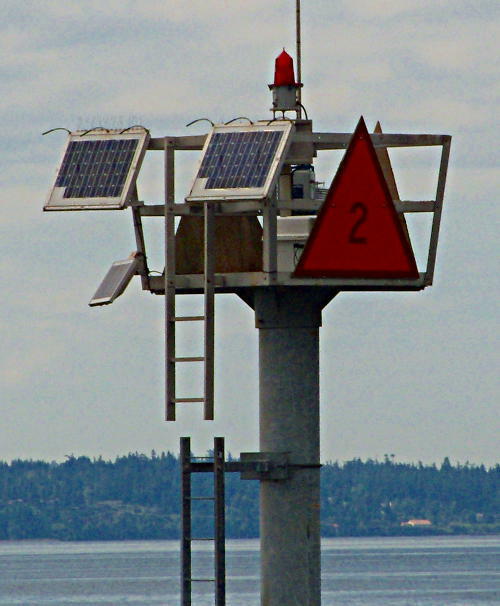 The AIS system in Puget Sound is also used by the Vessel Traffic System at Pier 36 to help keep track of ship movement so the ships know about traffic in their area. If you listen to VHF Ch 14 in the Seattle area, you can hear this in action all day long. When a ferry is leaving the terminal, it will call the VTS Center informing them of where they are leaving from and where they are bound for, the response from the VTS Center is a list of ships, locations and speeds that the ferry needs to be aware of to make sure they have a safe passage. Mr Lewald looked back a bit on his 30 years of service in the US Coast Guard and some of the changes he has seen. One of the more notable advances for him involved his time in command of Buoy Tenders. One of the jobs his tender and crew had on a river was close to a bend in the river. Large freighters would come down river and around the bend throwing up a large wake that put his crew at risk. They would listen on the VHF radio for ships coming around the bend and then try and get his crew out of harms way, a very stressful experience to say the least. Later AIS was added to the Buoy Tender and that let them literally see what was coming around the corner with enough warning to get the crew out of harms way. He said the stress went down greatly (maybe at least a factor of 10 or more), he was so relieved to have the AIS added to the Buoy Tender and the increase in safety. In response to several concerns from the public, the Coast Guard replied they intend to maintain the current Aids to Navigation in District 13. However there will be some changes, the light on Point Monroe across from Shilshole went away some time ago. The the buoys at the entrance to the channel leading to the Ballard Locks at Shilshole have recently been changed with the RW Safe Water Buoy being deleted and the # 1 Green and # 2 Red Buoys now have lights on them. New Shilshole Entrance Buoy with Red LED light. This buoy is smaller than the one it replaced so it will be a bit harder to see from a distance. changed. The Rear Range Light was deleted. 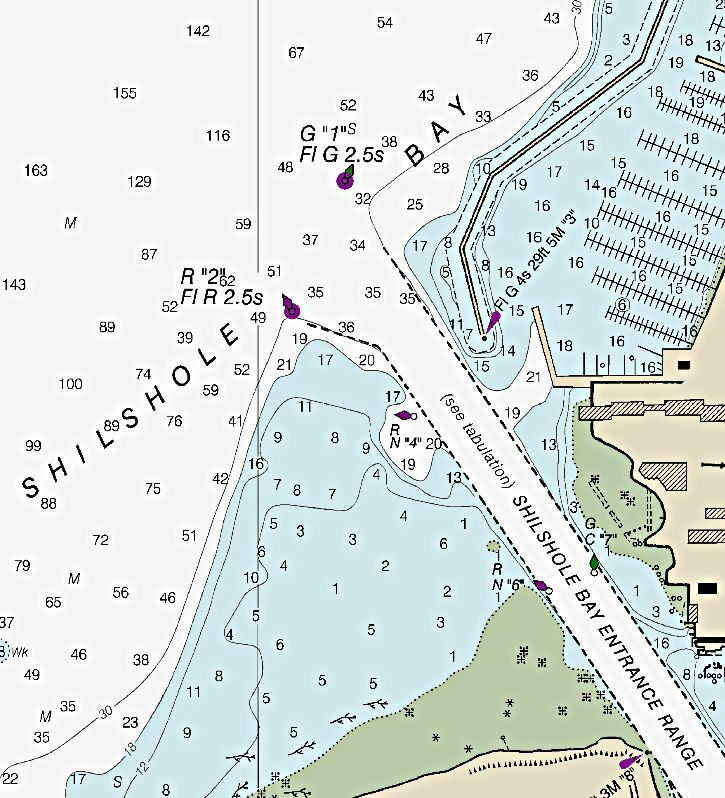 The Front Range Light was changed to “Shilshole Bay Entrance Leading Light with a Oc R 4s,19 ft” (Occulting (Light on time is greater than the off time) Red 4 second period, 19 ft above high water). The light is a single color sector light with the center of the beam (center of the channel) brighter than either side of the beam center. The old Range Markers were partially obscured by trees as a vessel approached the markers, the new light should not be obscured by the trees for a net gain in safety. 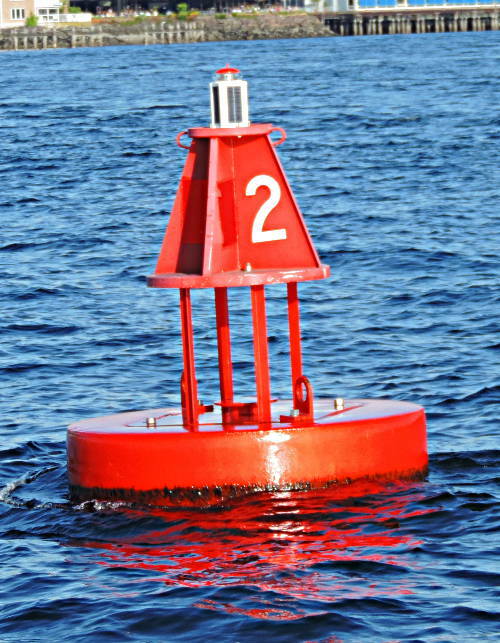 However the RW Buoy was an easy and popular target to aim for since it was in the center of the channel and visible from a greater distance than the Red and Green Buoys, so many boaters will need to find a new target. Vessel traffic and waterway use changes over time, water depth changes, all of which will have ATON’s change. Several times the Coast Guard said that the recreational boater would not be abandoned with any changes. Yes there are concerns by security experts and others that the AIS (as well as GPS positions) can be spoofed or faked to move an ATON off station to impede navigation or cause a vessel to go around. Yes a valid concern, however a prudent navigator NEVER USES A SINGLE POINT OF NAVIGATION. When you drive your car and use an onboard navigation system and the navigation system says “turn right on 64th street,” a prudent driver will check the street sign to make sure it is really 64th street and not an alley or someones driveway. Click this link to send a comment to the U.S. Coast Guard, NOAA or the U.S. Army Corps of Engineers on the future of navigation and ATON needs for your boating needs. Please be respectful, the people that receive this form are regular people like you and your neighbors. I would like to thank the members of the US Coast Guard for answering questions about some of the new ATON’s. This entry was posted in Boating Safety, Navigation and tagged aids to navigation, ATON. Bookmark the permalink.